Nearly 60 years ago, America and the world watched as the Soviet Union launched Sputnik into orbit, besting everyone else in artificial satellite technology and ushering in the space age. "Very few people really knew what a satellite was, or anything about a satellite," U.S. Rep. Randy Forbes, R-Chesapeake, said in a phone interview Thursday. "Then, all of the sudden, we see Sputnik going across the sky. And America had this Kodak moment for a while, saying, 'Oh, my gosh, we are getting behind the Russians.'" Sputnik sparked the space race that led to NASA's Mercury and Apollo programs and the U.S. landing the first man on the moon. Well, said Forbes, the race is on again. Only this time it's with China and advanced hypersonic vehicles. Last month, Chinese media announced a successful flight test of a hypersonic glider capable of flying at speeds of between Mach 5 and Mach 10, or five to 10 times the speed of sound. Hypersonic generally means speeds above Mach 5. This concerns Forbes, who serves on the House Armed Services Committee, and others because such technology theoretically could be used to send missiles hurtling over vast distances at a fraction of current speeds, leaving little time to respond. "This glider, if they develop it, will be able to beat most of the air and missile defense systems in the world today," Forbes said. "That should be a similar kind of Sputnik moment for us to realize we have got to reach not only existing levels of hypersonics — but we have to go to new horizons." To that end, Forbes was in Hampton Friday afternoon for a tour of NASA Langley Research Center before announcing the formation of a bipartisan congressional NASA Caucus intended to spur advances in select technologies, including hypersonics. The research center was deliberately chosen, he said. "Whether or not we're able to take advantage of the challenges and opportunities that hypersonics gives us," Forbes said, "is going to be dependent pretty much on the work that's done in Hampton, Va., at NASA Langley." The center was established nearly a century ago as the country's first civilian aeronautics laboratory, and continues to help develop next-generation aircraft technologies. The U.S. Air Force has been working on its own hypersonic technology, and in 2004 partnered with NASA — in this case, the Armstrong Flight Research Center in California — in a $300 million technology demonstration program to prove the viability of supersonic scramjet propulsion. After some initial failures, that effort culminated in 2013 when officials announced the historic final flight of the X-51A Waverider, a cruiser that reached Mach 5.1 and traveled more than 230 nautical miles at 60,000 feet in just over six minutes. Other partners in that effort were Boeing, Pratt & Whitney Rocketdyne and DARPA, or the Defense Advanced Research Projects Agency under the U.S. Department of Defense. The Air Force has said there was no immediate successor to that program, but that hypersonic research would continue. In an email statement Friday, Jay Dryer, head of the Advanced Air Vehicles Program at NASA headquarters in Washington, D.C., acknowledged that developing new hypersonic capabilities is "important for the country." "In the near-term, application of hypersonics is likely to be on enhanced defense systems," Dryer said. "But this could eventually expand to include improved access to space capabilities that would directly benefit NASA." 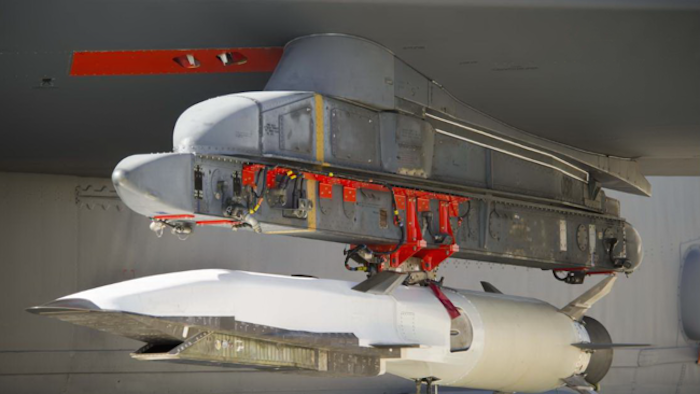 The space agency's Hypersonics Technology Project is part of its Advanced Air Vehicles Program. Dryer said their project will continue to research high-speed propulsion systems and other advanced physics-based models while coordinating closely with the Defense Department. Russia is also developing its own hypersonic technology, joining with India to develop a short-range supersonic cruise missile called BrahMos that can carry a nuclear warhead. "We just can't afford to let these other countries take the lead," Forbes said. At NASA Langley, the congressman was given a hypersonics overview and shown the hypersonic scramjet test facility where fundamental research is conducted, said center spokesman Rob Wyman. He was also briefed on other aeronautics activity, including a flying laboratory used to study Earth systems, the Cirrus SR22 single-engine plane that assisted the first government-approved drone deliver medical supplies last summer by remote piloting, and a model of a Mars flyer that could one day be used on the Red Planet. Forbes was also shown the "boom room," or supersonic simulation building, used to develop ways to minimize or redirect the loud booms generated by supersonic aircraft when they break the sound barrier. If successful, Wyman said, it could one day return supersonic flights over land. The next step for the NASA Caucus, Forbes said, is staffing it with members who will choose critical research areas to champion. "Instead of having one person that's promoting NASA, you will have a large number of members of Congress kind of speaking with a single voice," Forbes said. "Which should be hugely beneficial both to NASA and, we believe, to NASA Langley and the importance of the kind of work that's going to be done there over the next decade or more."